Some of my old and expensive watercolour papers had deteriorated into ﻿blotting paper so in an effort to salvage the situation I had been re-priming the papers with hot starch. It didn’t work! So after some research I decided to use the QoR Watercolour Ground. It’s like the primer used to prepare surfaces for acrylic paints, only this type is more absorbent. I used two thin coats and let the paper “cure” for a couple of days. It worked well, the painting surface became more like a hard sized hot press paper but with a rough plasticky feel to it. It is certainly not like painting on a good well sized paper like Arches or Fabriano! My first wash of Dioxazine Purple dried chalky. I had to layer on several glazes to get the vibrancy I want but the colours now turned a darker value than what I intended! Kuching people will have no problem identifying the flower subject – ruellias. 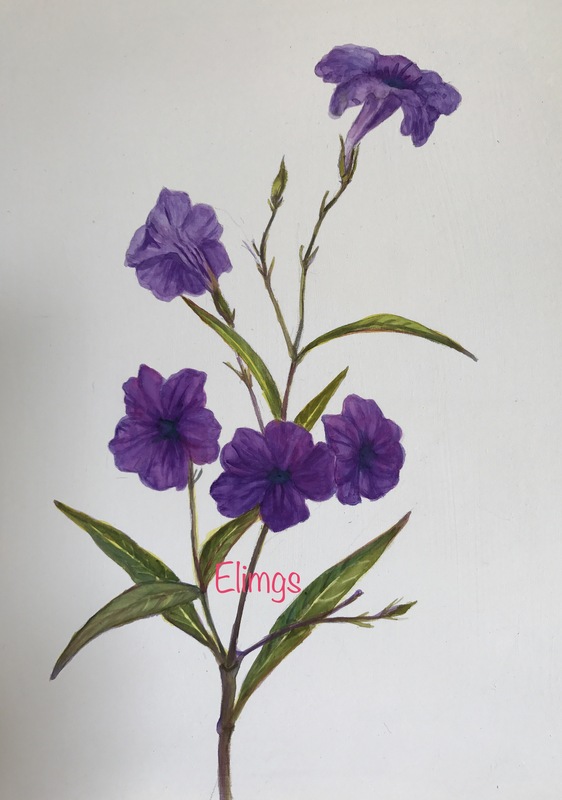 “Ruellias” painted on QoR Waterground with Cotmans Watercolours 9″ by 12″. By the way, taking a photo of the painting was tricky because the background, left white, was very reflective. 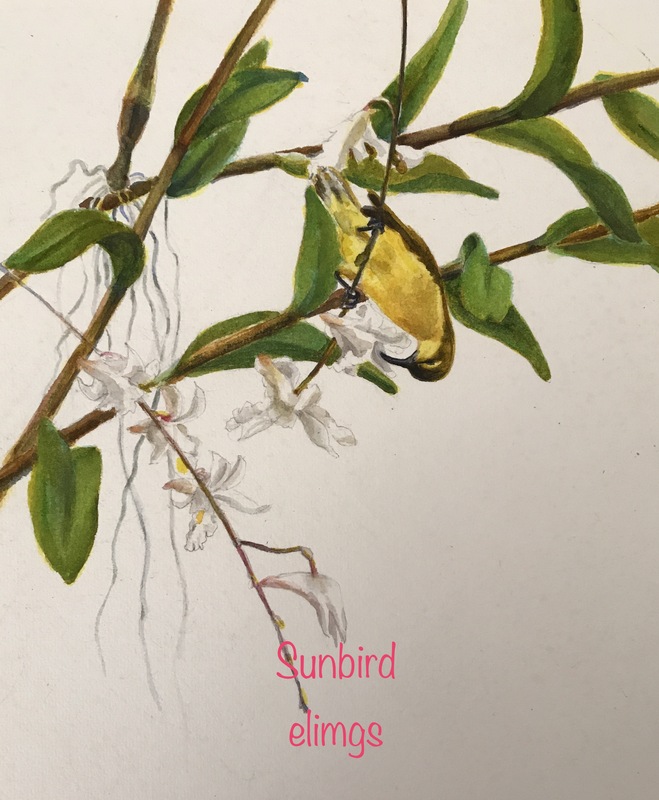 I painted a new and simpler version of the sunbirds and pigeon orchids. This is the female bird. I will be working on the male bird picture but have decided not to do the baby bird because it is so itty bitty and will be swamped by all those flowers, leaves and stems! This was painted on paper I found at a local store – “Campap” 300gsm 229x305mm acid free with high quality cotton fibre. I would rate it good, easy to paint on, well sized so mistakes are easily lifted off. I used the Korean brand “Shinhan” premium watercolours. I rescued Toffee in 2015. I noticed this toffee coloured skinny little dog seeking what little shelter she could from the hot sun by lying in shadow cast by a neighbour’s gatepost. She literally shook with fear when I approached but hunger overcame fear, and slowly over the next two days, she finally trusted me. Nobody came looking for her and nobody responded to ﻿my “Lost Dog” notices. So she became my dog! A check up at the vet showed she was weak and anemic from tick fever, so we had to treat that before we got her spayed and vaccinated. Now she is healthy and happy. She has become a favourite in my neighbourhood. And despite the fact that her first ever car ride was to the vet where she was poked at with various instruments and needles, she still loves car rides and will jump in at every opportunity! It’s also funny how when we stop at traffic lights, other drivers or motorcyclists will smile and point when they spot her looking cheerfully out of the car window! This is a quick sketch done on the Cartera Magnani paper I bought some years ago. The paper sizing had gone and it had become blotting paper – couldn’t do any washes! I made up some hot starch and “primed” the paper surface, but the starch dried unevenly. But I could paint on it though with some difficulty. You can see the brushstrokes because the washes soaked right in and couldn’t be moved anymore! 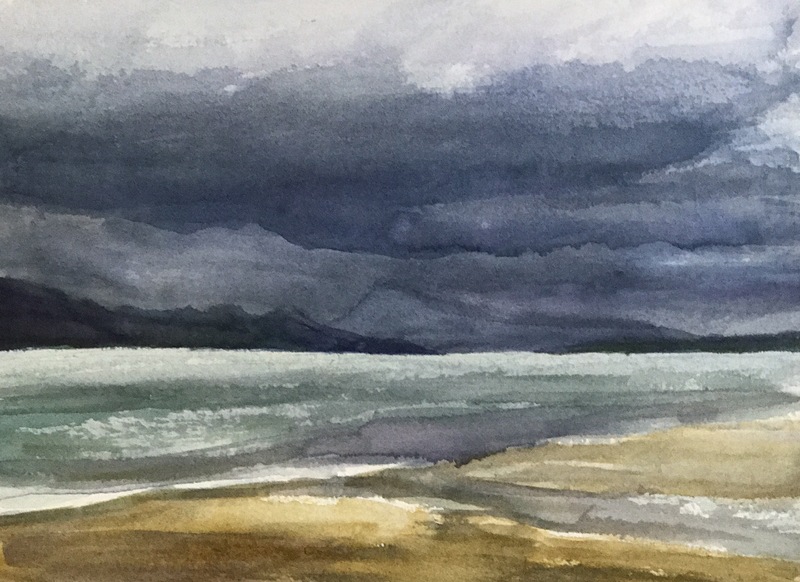 Another fast sketch of an approaching storm on 140lb Arches cold press paper. It’s very expensive paper which I bought online intending to paint my collection of phalaenopsis orchids. I thought the surface would be similar to Fabriano’s cold press, but it’s not! It’s rougher. I might do the ironing trick again, but first, try out on a quick sketch! There were a couple of spots here and there that resisted the washes but it could be due careless handling with my greasy sweaty hands! Anyhow Arches lives up to its premier reputation. 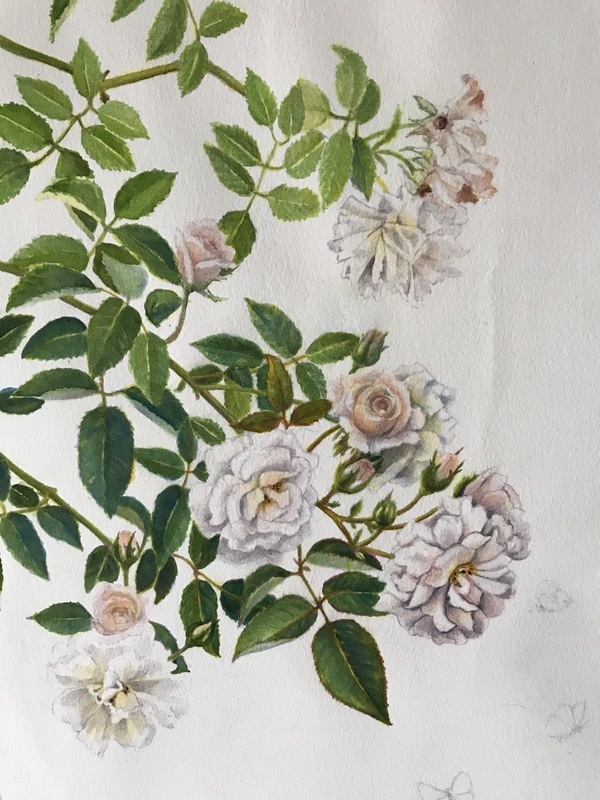 So my rambler rose painting cockled with a big crease! After mulling over whether to continue painting or to chuck it in the bin, and after researching what other artists do to straighten such paper, I decided to try the ironing method. Makes sense to me, after all, the Fabriano paper is 100% cotton rag! So I put the painting face down on a old bedsheet, dampened it with a water spray and ironed out the creases. Then I placed a heavy board on top of the steaming paper and left it for some hours. Viola! Paper is flat, creases hardly visible so I completed the little butterflies and continued cleaning up the colour runs with titanium white. Now I wondering if the paints have been affected in any way by the heat. Looks okay though my use of titanium white has made the painting look more like a vintage gouache than transparent watercolour! Oreo is the cute/ugly black dog I rescued early this year (before the rabies outbreak!). She literally tottering on her last legs, ribs sticking out, covered with festering wounds big and small. The weather was pretty bad with heavy downpours. She would just sit shivering in the pouring rain if there were no parked cars around to shelter under. It took me a week of leaving out food and water before I gained her trust and she mustered up courage to shelter in my car porch. Here she is now, sores healed, spayed, vaccinated and plays everyday happily with all my other rescued dogs! I was cleaning out my paintbox and found barely used tubes of Winsor & Newton Lamp Black and Paynes Grey, purchased years ago! Have you seen the prices of paints lately? Shocking. 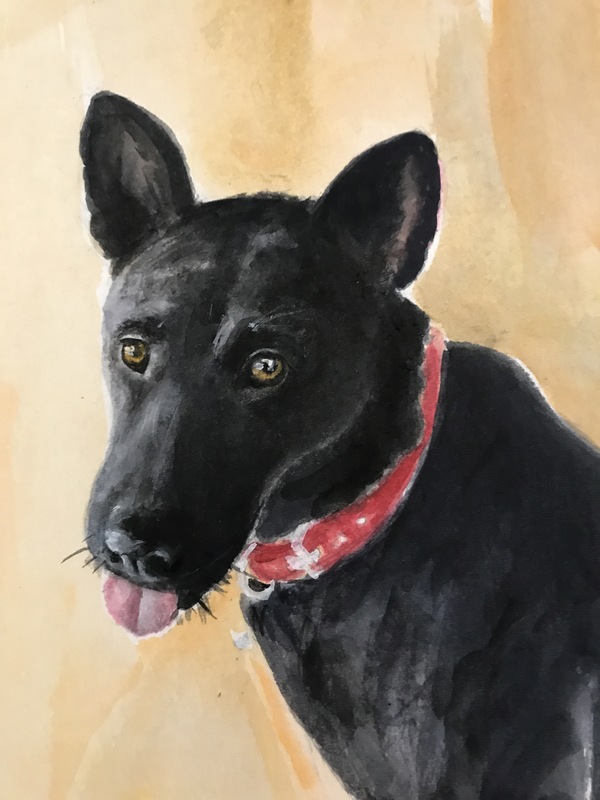 I decided to use up some paints on a picture of Oreo. I used Holbein’s Titanium White to pick out the highlights of her eyes. She is ugly but such a sweet gentle dog , just look at her eyes! 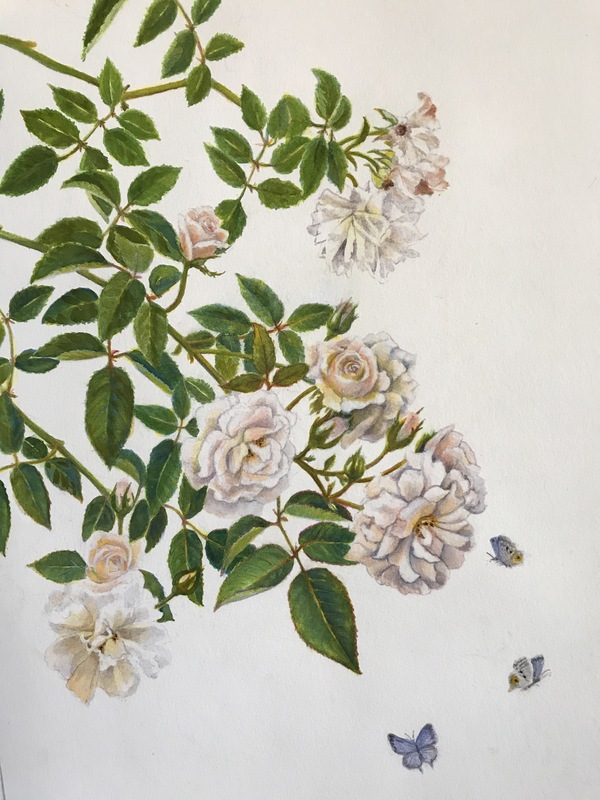 I was painting this rambler rose from my garden. I had flower cuttings in a plastic vase in front of me. By the time I got to painting the leaves, the flowers were withered and in removing the vase my fingers slipped and water sloshed right on the middle of the painting! Disaster! The white flowers weren’t too badly affected but the colours of the leaves ran and the paper buckled! 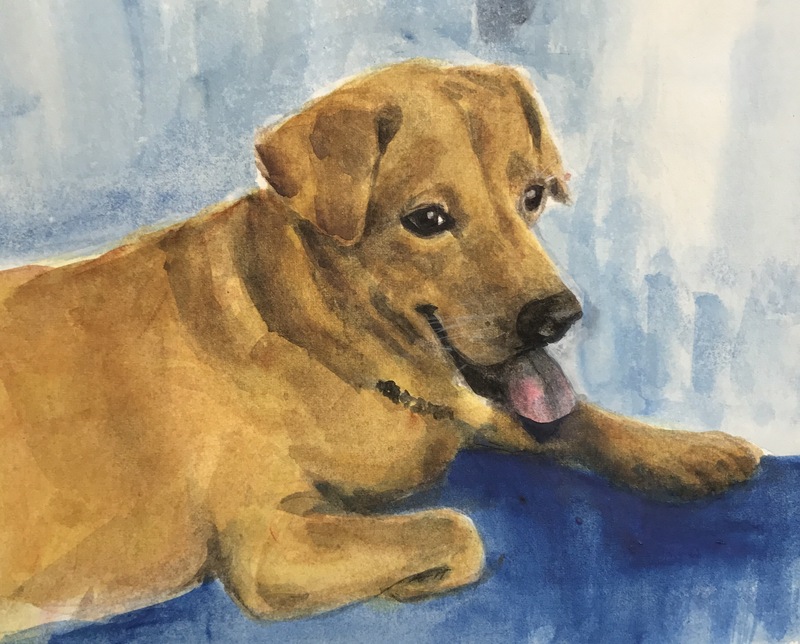 I had not previously stretched the paper (Fabriano 140 lb Artistico Extra White) because I didn’t expect to do juicy watery washes for this picture. I tried salvaging by covering the runs with titanium white and recolouring the leaves but everything got too dark! And that buckled paper? How ah?? Back to the drawing board … luckily that rambler rose still has some flowering branches! More Orchids from Mahmud Yussop! More Sarawak from Mahmud Yussop! my niece travels all over Sarawak!